May 14, 2018 — On April 18th, the North Fork Valley Creative Coalition (NFVCC) was awarded a $10,000 grant from Colorado Creative Industries’ Creative District Technical Assistance program to develop a Signage and Wayfinding Plan for Paonia Creative District and Town of Paonia. NFVCC will hire C+B Design, LLC of Henderson, CO to facilitate the planning process. The Signage and Wayfinding Master Plan will include a comprehensive inventory of existing signs in and around Paonia. Through a series of community-driven focus groups, NFVCC will develop designs and a plan for new signage, including: highway signs, gateway signs into town, Creative District signs, wayfinding signs, banners on light-poles, a visitors’ kiosk, bike racks, benches, and flower planters. 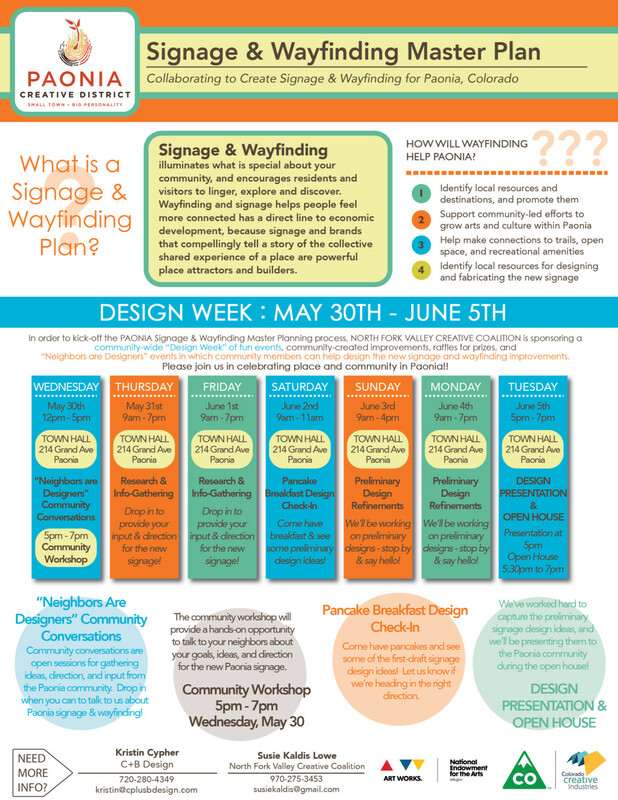 In order to kick-off the Paonia Signage & Wayfinding Master Planning process, NFVCC is sponsoring a community-wide Design Week of fun events, community-created improvements, and “Neighbors are Designers” events in which community members can help design the new signage and way finding improvements. 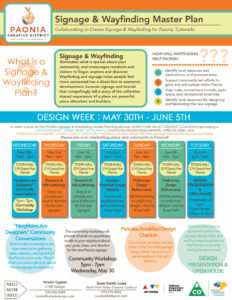 You are invited to participate in the Design Week on May 30th through June 5th at Town Hall, 215 Grand Avenue, Paonia, CO.